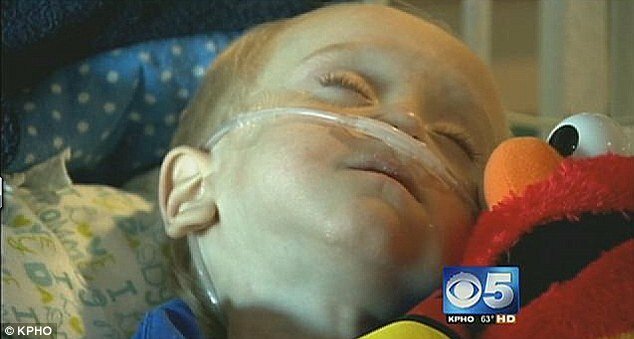 Emmett Rauch, a 2-year-old toddler from Arizona who swallowed a tiny battery, has undergone multiple surgeries as doctors struggle to save his life. Emmett Rauch swallowed a lithium battery from a remote control and has since had 18 surgeries in the past year at Phoenix Children’s Hospital in Arizona. Toddler’s mother, Karla Rauch, said no one saw he swallow the battery and the first symptoms he had were similar to a cold. Emmett Rauch has had four inches of his oesophagus removed after the acid from the battery burned two holes through it. The toddler has also suffered multiple cases of collapsed lung and had close to 200 X-rays. He has spent more than 19 weeks of his young life in the pediatric ICU. The batteries are so dangerous because they don’t have as much casing as an AA battery. A nurse who cares for Emmett Rauch, Michelle Chacon, said she has seen several cases of children swallowing batteries and that more should be done to make families aware of the household danger. Michelle Chacon has helped the Rauch family set up a charity to raise awareness about the tiny batteries which are used in everyday objects like clocks, cameras and calculators. According to the National Capital Poison Center, each year in the U.S. more than 3,500 people swallow miniature disc or button batteries. The charity called Emmett’s Fight aims to inform about the dangers of button battery ingestion. The symptoms are similar to the common cold or the flu – fever, lack of appetite, coughing and increase of mucus production.